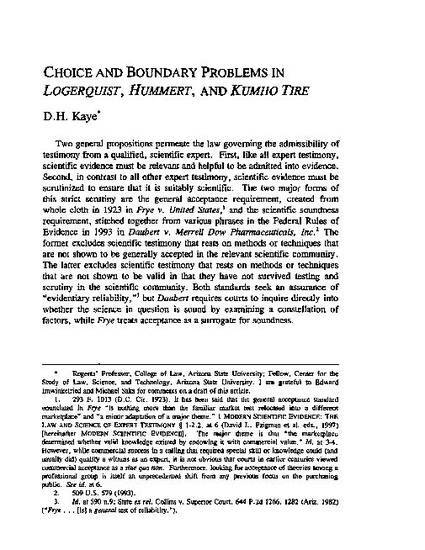 This article, part of a symposium on the opinion of the Arizona Supreme Court in Logerquist v. McVey, questions that court’s rationales for refusing to apply heightened scrutiny to psychiatric testimony about the retrieval of repressed memories. It also challenges the court’s use of a “personal observations” exception to the heightened scrutiny standard of Frye v. United States. It proposes that a better solution to problems of scientific and expert evidence would be to adopt a sliding scale that attends to the use to which the evidence is put and the degree to which it has been shown to be valid and accurate for that use. Although the article delves into Arizona cases, these topics of deep and immediate national interest. The issues and arguments roiling in the cases are and will continue to be sources of confusion and controversy across the nation. These cases show that the transition from exclusive reliance on the general-acceptance standard of Frye v. United States to the scientific soundness standard of Daubert v. Merrell Dow Pharmaceuticals is far from complete. They reveal that the meaning and implications of “applying Daubert” to nonscientific or expert testimony have yet to be fully understood. And the Arizona cases advance an approach that is a variation on what courts in many jurisdictions do when they wish to avoid the confines of Frye or Daubert. Careful analysis of these matters is timely, if not overdue.